modernduck.com | who needs pants? I saw this tag on some underwear and immediately thought of pphaneuf. 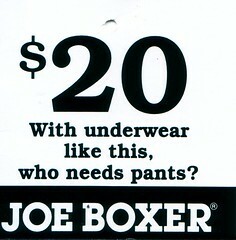 Of course, I also bought the underwear. This entry was posted by scjody on February 13, 2008 at 19:52, and is filed under Uncategorized. Follow any responses to this post through RSS 2.0. Both comments and pings are currently closed.